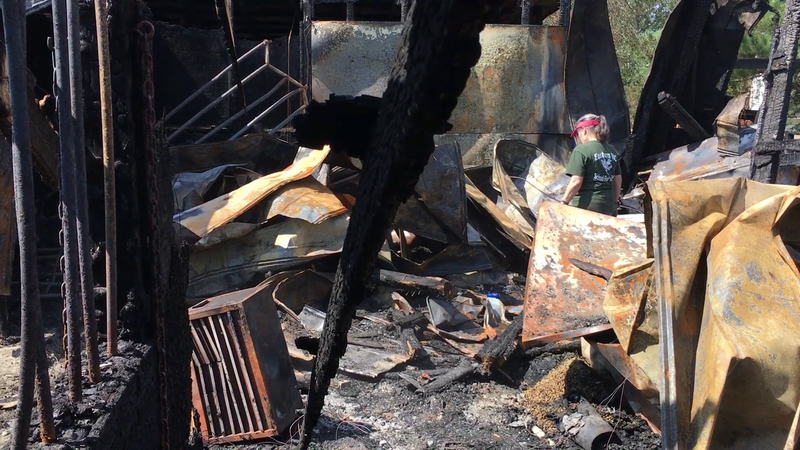 Sonja Duke, of Illustrious Morgan Manor outside Elm City, works Wednesday to salvage tack from the horse barn destroyed in an early Tuesday fire. ELM CITY — Sonja Duke has lived her worst nightmare. The owner of Illustrious Morgan Manor awoke at 4 a.m. Tuesday when she heard a bang in the barn near her home on Town Creek Road southeast of Elm City. Duke opened horse stalls, pushing horses out and closing doors so they wouldn’t run back in. Duke’s husband Lee Gordon was away on business and her parents had yet to return from Pennsylvania after fleeing Hurricane Florence. Duke, all alone, managed to save nine of the 10 horses in the barn. The tenth, LouE, was one of the first Duke tried to save in the stall closest to her house. “When I came up, his neck and shoulders were on fire and I couldn’t get him to come out, so I went to the others,” Duke said. Somehow, LouE got out and headed away with some of the other horses headed down the road from the blazing barn. Duke later leaned that LouE had died in a crash with one of the first responders’ personal vehicles. “As much as I dearly love him, I think it was to his better because he was severely burned at that point, so I don’t think he would have made it anyway and certainly didn’t want him to suffer,” Duke said. A second horse, Tia, was also burned by the flames. “She was pretty well singed on her back,” Duke said. Duke hopes Tia will be able to recover. Duke, who has been in the horse business for 45 years, came to Wilson County in 1999 from Pennsylvania. She and her husband added on to existing tobacco structures including an old packhouse to make a stable. They created a tack room used for lessons and a school. Duke and Gordon have a combination of horses, mostly Morgans, Arabians and saddlebreds, along with a couple of ponies. The structure destroyed in the fire is about 60 by 75 feet in dimension. On Wednesday, is was a matter of mopping up the debris. Friends put on gloves and sifted through twisted tin roofing retrieving buckets, tack, chains, horseshoes, tools, stirrups, bridles, saddle racks, files, clippers, hinges, sinks and whatever might have value. On Tuesday, Ayers helped Duke with insurance paperwork. Debra Batchelor of Lucama came over Wednesday to help separate things out of the rubble. Duke said she’s witnessed an amazing outpouring of help and support. Cavvietta Quarter Horse and Cattle Co., a neighboring business along Town Creek Road, offered to house the horses who needed stalls during the recovery effort. That included members of the Bakertown Volunteer Fire Department, Toisnot Rural Fire Department, East Nash Fire Department, Macclesfield Volunteer Fire Department and West Edgecombe Volunteer Fire Department. Bakertown Fire Chief Kevin Gardner said the fire’s cause is classified as accidental. “I believe it’s electrical in nature,” Gardner said. Gardner said the horse LouE ran in front of a car responding to the fire and was struck and killed. Gardner said it’s remarkable Macclesfield firefighters were able to respond considering their station burned to the ground Sunday, resulting in the loss of several trucks. The needs are for “just basically everything.” To reach Duke, call 252-245-1340.